Over 100 Burning Man Regional Contacts and Community Leaders converged last weekend in San Francisco to attend the 4th Annual Regional Leadership Summit. A generous donation of space at-cost from the Bently family made it possible for us to hold our event at the beautiful state-of-the art Bently Reserve in Downtown San Francisco. The purpose of the Summit was to bring together leaders from across the world to exchange ideas, learn new skills and to explore the nature of community as it pertains to the evolving Burning Man Regional Network. The first ever Convectional Caucus took place at the Bently Reserve on Friday afternoon. A total of 37 Burning Man departments, arts groups, theme camps, non-profits, and other community organizations set up convention-style information tables where Summit attendees could learn about their various philosophies, processes, and ambitions. The Caucus was a tremendous success and provided a unique platform for Regional Contacts and other Community Leaders to interact with BM Staff and Bay Area groups in significant ways. 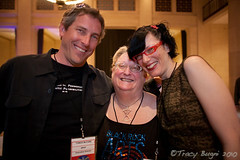 The photo includes Tomas McCabe, Executive Director of BRAF, Affinity your BRAF blogger and Josie Schimke, Program and Development Assistant for BRAF. Tomas, Freddy Hahne and Josie represented BRAF during the Caucus. Affinity was the registrar for the Regional Event.